Enjoyably trashy sci-fi thriller with good effects, strong performances and some nice ideas, though it's not quite as clever, as creepy or as much fun as it could have been. Based on the graphic novel by Robert Venditti and directed by Jonathan Mostow, Surrogates is set in an alternate version of the present, where the majority of the world's population choose to live their daily lives through robotic surrogates, controlled from the safety of their own homes. 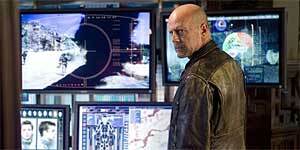 However, when a mysterious weapon causes the deaths of two surrogates and their controllers, it's up to FBI Agents Greer (Bruce Willis) and Peters (Radha Mitchell) – both surrogate users themselves – to catch the killer before the technology falls into the hands of an anti-robot movement led by The Prophet (Ving Rhames). Meanwhile, Greer is forced to confront the fact that both he and his wife Maggie (Rosamund Pike) have become too dependent on their surrogates following the tragic death of their son several years previously. The film uses a combination of make-up effects and digital trickery to create the impressively eerie robotic quality of the surrogates, but this is heightened by some superb robotic acting from Willis, Mitchell and a perfectly-cast Pike (Mitchell's robot-in-a-tight-skirt totter is a particularly enjoyable detail). There's also strong support from James Cromwell as the reclusive billionaire genius behind the surrogate technology, though Rhames is sadly underused as The Prophet. The script addresses several interesting ideas and Mostow delivers a couple of decent action sequences, including a helicopter crash, a chase scene and a car chase, the weirdness of which is heightened by the robotic bodies that keep stacking up on the bonnet as Greer drives into them. That said, though the film handles its emotional moments well (particularly the scenes between Willis and Pike), the climax feels rushed and is slightly confusing as a result. In addition, the film badly needs a shot of black humour to liven things up a bit and you also can't help feeling that they could have done more with the central premise. On that note, avoid the trailer if possible, because it's extremely misleading and gives away the film's key moment. Surrogates is an enjoyable sci-fi thriller that's worth seeing despite its flaws, thanks to strong performances and some nice ideas.